Nice bit of world building from J.P. Jackson, author of Daimonion, and a great addition to the horror/fantasy genres. This is his second novel and it shows, with a surer hand and confidence in the writing. It’s unfair to compare the two books because they are so different. Daimonion was a good, gory read, but with Magic Or Die, the self-assured plotting, scene-building and dialogue make for a book that is more accessible to people unused to the demon genre. In a nutshell, we have James who has his own demons, namely guilt, grief and alcohol. The blurb describes him as an alcoholic, but I wouldn’t have gone that far. Yes, he uses drink to numb his pain, but he seems to function perfectly well once he has his five students on-side and they are fighting for survival. He only has a few months to get them under control and able to use their powers in a way convenient to a sinister organisation (CMRD – read blurb). If he fails, it’s curtains for all of them. I won’t say more because this is a review, not a synopsis, but you get the idea. I love the way the author has made everything very clear. From the start, I knew what the modus was, and the problems James has to overcome in order to achieve it. I understood the difference between Arcanes and Elementals because all that information is right there, and so often in these genres it just isn’t. He manages this without patronising the newbie or alienating readers experienced in the genre. In short, it’s a bloody good, enjoyable read. The students all had their own demons (surely an allegory for real life.) I was waiting for the poison pill, the one to screw things up for everyone else. There is a candidate, but I won’t spoil it. The real boo-hiss villain is Miriam, a cross between Cruella de Ville and that evil witch from The Emperor’s New Groove. Maybe she is a little too much of a caricature, but it’s a small point in a book of interesting characters and curious dilemmas, all set within the confines of a strange, maze-like building without any obvious means of escape. The students are a lively bunch, honey-toned Isaiah and his lascivious, blue-eyed demon, enraged Chris, unable to fully control his inner fire wolf, the anime-like Ning and ethereal Camila and Annabelle. All have spectacular skills which, if not harnessed, are a threat to civilisation. The atmosphere is eery, with beautiful descriptions as each display their power. The sexual tension between James and Isaiah is subtle rather than full-on. It was a fun, spooky, tense mix, with a good building of atmosphere and an exciting finale. A solid start to a promising series. James Martin is a teacher, a powerful Psychic, and an alcoholic. He used to work for the Center for Magical Research and Development, a facility that houses people who can’t control their supernatural abilities, but left after one of his students was killed, turning to vodka to soothe his emotional pain. The problem is he still has one year left on his contract. 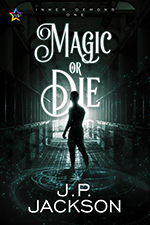 When James is forced to return to the CMRD, he finds himself confronting the demons of his past and attempting to protect his new class from a possible death sentence, because if they don’t pass their final exams, they’ll be euthanized. James also discovers that his class isn’t bringing in enough sponsors, the agencies and world governments who supply grants and ultimately purchase graduates of the CMRD, and that means no profit for the facility. James and his students face impossible odds—measure up to the facility’s unreachable standards or escape.